In the 1940's my pals and I built a raft from railway sleepers and went sailing on the canal opposite to Blochairn Steelworks oblivious to the fact that many a child was drowned in it. To top matters my father was employed as a labourer in the furnaces there and I am glad to say he never knew how stupid we were. My family moved to Ruchazie in 1967. About 50 feet from our back garden was the Monklands Canal. There where a number of shallow crossing points along the canal and like Frank we also made a raft to cross where the water was deeper. I remember when we first moved to Ruchazie seeing the odd barge traveling toward Cranhill. It wasn't long although then it seemed like a lifetime before the barges were withdrawn and the canal closed off to make way for the M8. We had many adventures along the banks of the Monkland Canal and many fond memories. Thanks Alex for that photo of what was once the last hole in the golf course. It brought back a wonderful memory of how my young sister and I during the war would go to the Gas Works on the other side of the canal to get a bag of charcoal on our sledge. We would have fun for an hour or so on that hill sledging and then go for the charcoal. I have posted a similar photo on the Auld Glasgow Buses and Trams Topic showing the Gartcraig Garage. The photo above was a field that lead to the football pitches. It was taken from the rear of Gartcraig Road. We built a few dens on that field mostly with wood taken from Barlinnie Prison Workshop which was just across the canal from here. The Prison Vegetable Fields would be raided on a regular basis by the boys and girls from Ruchazie. The canal bank gave easy access to the field and prior to the big wall being erected you could get through the field into the Woodwork Shop. On adventures up toward the other wooden bridge at Cranhill(there was one where the Gartcraig Flyover is now) we searched the water for treasure. It was rumoured that someone found old Roman coins just under the bridge. We had to be careful not to be seen by the boys from Cranhill as there was a bit of rivalry with regular fighting on the wooden bridge on Gartcraig Road. We never found any Roman coins but i remember finding some old pennies in the water. Just across the Gartcraig Bridge was a large valley with a big tree. There was always a large ropeswing here. The most daring would jump from the wall at the road whilst other took off from the canalbank. Under the bridge was a walkway where the horse use to pull the barges along the canal. Whenever there was a barge on the canal it attracted quite a bit of attention. You would follow it as far as you could along Bankend Street and wait for it to return. Then follow it up to the pitches on its way toward Blackhill. I remember houses at the other side of the canal from Bankend Street. This bank supplied the best brambles but also had the most hornets nests. One year there was a big storm and a couple of trees fell on some of these houses. Not long after this they were the first houses to be demolished to make way for the new motorway. During the construction of the motorway they built a teporary road at the rear of Gartcraig Road and closed off the bridge. This ensured that we could have our regular games of tennis on the road witout having to look out for cars. Because of the rocks below where we lived there was regular blasting to clear the way of the new road. A large blast of the siren gave warning of the next blast. It wasn't long befor we couldn't get to the field of previous adventures. The memories never go and I will alway remember the Monklands Canal. Alex, do you have any pics before the M8? marginalwalker wrote: Alex, do you have any pics before the M8? I will need to get into my Mothers Photograph Collection and see what I can find. I now there is one of a group of friends in the field where the above photo shows. I remember one Christmas getting a new Scotland Football Strip and we were taken up the pitches by my dad and brother. I have a feeling there was a picture of this but not sure. If not then I will contact a friend who I am sure will have some photos if he has not thrown then away since his mother died. There are quite a few good photographs on the RCAHMS site, but there is no way I am linking to them, posting them, or telling anyone where they are or how to access them in the current climate!!! Head down, tin helmet on! Alycidon wrote: There are quite a few good photographs on the RCAHMS site, but there is no way I am linking to them, posting them, or telling anyone where they are or how to access them in the current climate!!! Ok so we need to stick with private collections them. 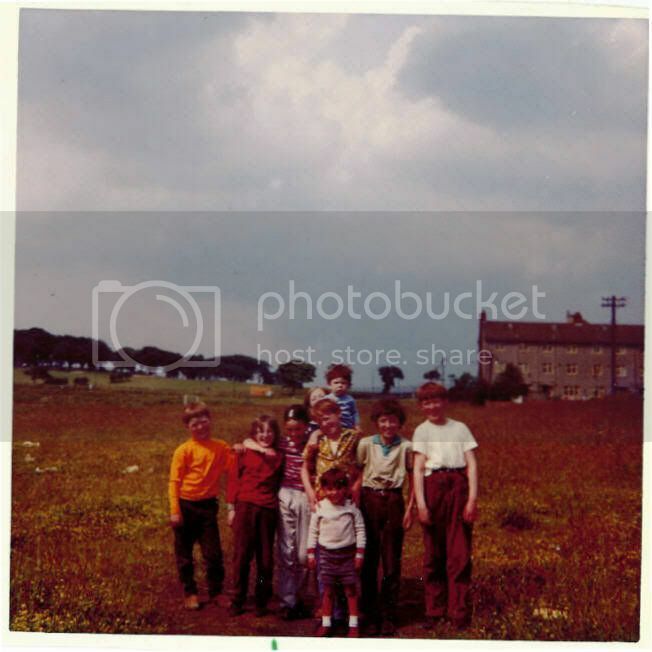 Well I will need to post this photo that includes some friends and relatives from the early 70's. That's the 1970's before anyone has a dig. This picture was taken about 20 yards from the position of the picture above. 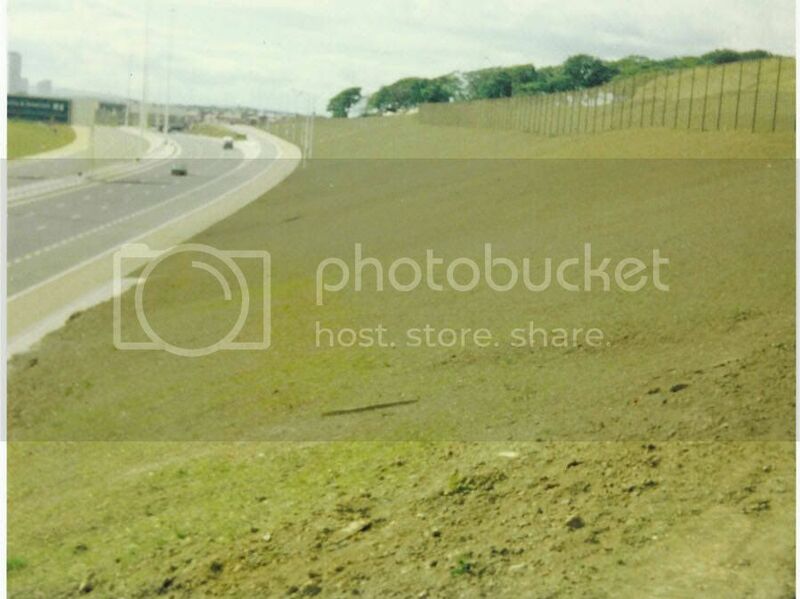 Although taken at a different angle it shows the fields that were lost to build the M8. Unfortunately I don' think I have any pictures of the canal. If anyone knows the location of photos on the net I would be happy to make contact and request permision form the organisation hosting the pictures to use on this site. Alex Glass wrote: Ok so we need to stick with private collections them. Well I will need to post this photo that includes some friends and relatives from the early 70's. That's the 1970's before anyone has a dig. Which one are you Alex ? That's not colour its been touched up. Ops! maybe i shouldn't have said that. Have a look at the Evening Times website, specifically Times Past. They have a cracking aerial Then and Now of the new Glasgow Fort and the old canal. Thanks for that pic Alex. The landscape has changed so much in just a few decades.. Looks like a different planet.. The last photo was taken about 1971 and the the first was taken about 1980. I have many pictures in my mind but sadly I didn't take a camera with me during that period of growing up. Like your suggestion about the Evening Times. Will have to get a look at the photos you suggest. Just remembered a picture from the Mitchell. taken of the other side of the Gartgraig flyover. Away to find it and will post it later.